Mini fancies its latest Clubman as more an executive car than a typical premium compact. Think BMW 5 Series to the regular Hardtop’s 3 Series. With that in mind, you can think of the new John Cooper Works Clubman as a Mini M5 of sorts. 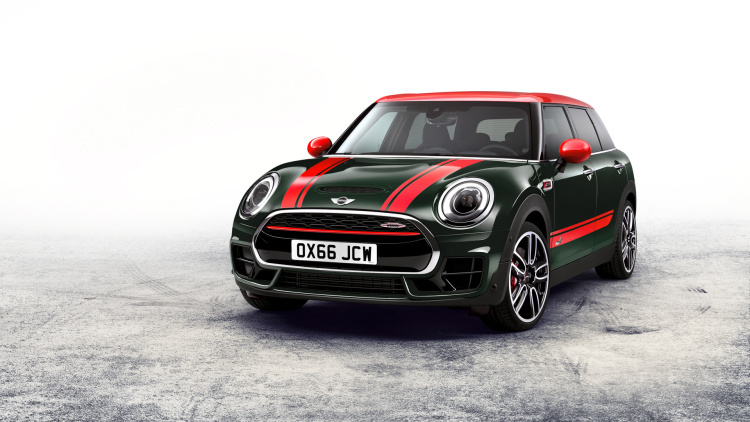 The new JCW Clubman boasts a number of features not offered on its little brothers. Mini engineers are squeezing 228 horsepower out of the 2.0-liter, turbocharged four-cylinder, just like on the Hardtop model. But the bigger John Cooper Works gets a significant bump in torque, up from 236 pound-feet of torque to a more robust 258 lb-ft. And with a standard All4 all-wheel-drive system, the JCW Clubman maximizes the ability to deploy that extra power. Regardless of transmission, the new Works model hits 60 in 6.0 seconds and runs up to 147 miles per hour, 0.9 seconds quicker and five miles per hour faster than the S model we drove last year. A sportier suspension, meanwhile, drops the ride height 0.4 inches, so expect at least slightly better handling from Mini’s newest Works model. Exclusive two-piece sport seats should keep drivers in place while exercising the newfound handling ability. But beyond the extra power, all-wheel drive, upgraded suspension, and neat seats, the JCW Clubman is largely a mishmash of parts we know and like. It uses the same standard six-speed manual and optional eight-speed automatic as the regular car, while the polarizing six-doored body wears the usual JCW tinsel – 18-inch wheels and a more aggressive body kit that promises better engine and brake cooling. And it still has a weight problem – the new car weighs in just under 3,500 pounds to the standard car’s 3,300-pound curb weight. Mini hasn’t published pricing, but if the trend set by the Hardtop and Convertible continues, we’d wager the new JCW will start around $35,500, tacking $6,000 onto the S model’s $29,450. Well, at least Mini has the executive-level pricing down. The John Cooper Works Clubman should hit US dealers in December.